How Do Optimization Modes Work? Optimization Modes are selections available for Fire & Forget™ that let you decide how to to optimize your campaign based on how you want the campaign to run. You can only have one Optimization Mode selected per campaign. In the Fire & Forget™ Settings drawer in Campaign Details or during Add Campaign you can choose one of 3 optimization modes: None, CPA Goal, or Acceptable Profit. When you select an Optimization Mode, Fire & Forget™ displays different fields which you can edit, and features that you can enable or disable depending on the mode. Most notably, the CPA Goal Optimization Mode does not include a Site section for optimization, only Campaigns and Day Parting are available. To change Optimization Modes, select the mode on the Campaigns section of Fire & Forget™ Settings. The None Optimization Mode has 3 sections - Campaigns, Sites, and Day Parting. 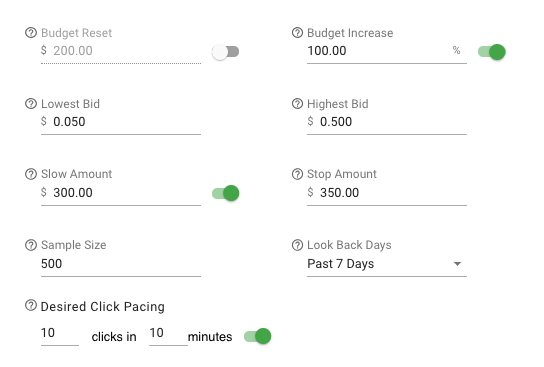 The None mode Campaigns section includes the features Budget Reset, Budget Increase, Lowest Bid, Highest Bid, Slow Amount, Stop Amount, Sample Size, Look Back Days, and Desired Click Pacing. The Look Back Days value is listed in the Campaigns section, but works only for Site Acceptable Profit on the Sites section as there is no campaign level Acceptable Profit in the None Optimization Mode. The Sites section looks like the previous iteration of Fire & Forget™ and includes Site Acceptable Profit, Sample Size, Lowest Bid, and Highest Bid. The Day Parting section for all Optimization Modes looks identical. Click here to read more about Day Parting. The CPA Goal Optimization Mode has 2 sections - Campaigns and Day Parting. 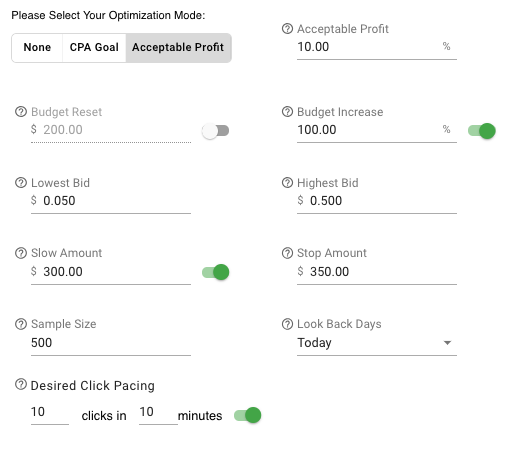 The CPA Goal mode Campaigns section includes the features CPA Goal, Budget Reset, Budget Increase, Lowest Bid, Highest Bid, Slow Amount, Stop Amount, Sample Size, and Desired Click Pacing. Note that the Look Back Days option is missing - by default CPA Goal operates with a Look Back period of Today. Click here to read more about CPA Goals. The Acceptable Profit Optimization Mode has 3 sections - Campaigns, Sites, and Day Parting. The Acceptable Profit mode Campaigns section includes the features Acceptable Profit, Budget Reset, Budget Increase, Lowest Bid, Highest Bid, Slow Amount, Stop Amount, Sample Size, Look Back Days, and Desired Click Pacing. Click on the button on the Campaigns section of Fire & Forget™ Settings to switch Optimization Modes for Fire & Forget™. Depending on which plan of Maximus you are on, you will have access to certain Optimization Modes. For Starter users, you are only able to choose between None and CPA Goal. 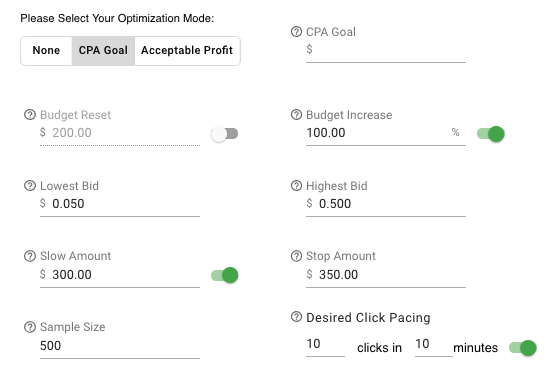 For any optimizations you must then select the CPA Goal mode for your campaigns. Note that the Sites section is absent in the None mode as this is a feature of the Pro Plan and allows you to do site Fire & Forget™ optimizations. Selecting a mode depends on how you want to run your campaigns. If you want to disable campaign level optimization but use Site optimizations, select the None Optimization Mode to remove campaign level Acceptable Profit. The CPA Goal mode can be effective if you know your target CPA for the campaign you're running and lets you to be more hands off managing your campaigns. Acceptable Profit gives more granular options and the ability to choose Look Back Days for optimizations versus the CPA Goal mode. With more options you can customize the optimization more to your preferences, and also run Acceptable Profit exclusively at the campaign level.